Keeping your pump in shape will help reduce costs and boost profits! Cut fuel consumption, reduce replacement parts costs and minimize pumping time on every job! A PUMP THAT LETS YOU DOWN when you need it most causes obvious losses of time and money. 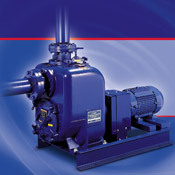 Not so obvious, but every bit as costly, are losses you can incur with pumps that operate at less-than-peak efficiency. A pump laboring under the handicap of a suction line air leak, a corroded discharge line or a clogged impeller uses excessive energy, takes longer than necessary to do the job, and subjects parts to undue stress, causing premature failure. HOW HIGH CAN THE LOSSES RUN? A 6-inch gasoline-driven, self-priming centrifugal pump operating at 25% less than peak efficiency through an eight-hour day uses approximately 8.8 gallons more fuel than a pump operating efficiently. At $2.00 per gallon over a 40-hour week that’s $80.00 per week LOST! And that figure doesn’t include additional service costs! Multiply these possible hidden losses by the number of pumps you have in operation and you see why it pays to keep your pumps in top working order. Gorman-Rupp wants to keep your pumps efficient. If you already own Gorman-Rupp pumps, you know how easy they are to service, so there is really no reason to let them deliver less than their best. But even if you don’t own Gorman-Rupp pumps, you’ll find our 9-point checklist helpful because today every penny of profit counts, and we want your pumps to work as efficiently as possible. There is a noticeable difference in pump flow. Has the discharge flow visibly decreased? Is it taking your pump longer to do the same job than it used to? The slow-up might be caused by a collapsed suction hose lining, a leaking gasket, a plugged suction line, or a damaged or worn impeller or wear plate. Your pump isn’t repriming as rapidly as it once did. Most commonly, slower reprime can be attributed to excessive face clearance. If this is not the cause of your slowdown, check the following: Is the seal leaking? Are all hardware at gaskets tight? Is the suction check valve sealing properly? Is the cutwater section of the volute badly worn? Is the recirculating port clogged? Your pump is making excessive noise. Does it sound like a bunch of marbles rattling in a can? This may be an indication of cavitation and could be caused by a suction lift that’s too high, a suction hose that’s too long or plugged or that has a collapsed lining, a clogged strainer, a combination of any of these, or perhaps a problem on the discharge side of the pump. Failing bearings can also cause excessive noise. Your pump is clogging frequently. The suction check valve may be clogged, the strainer may be too large or too small, face clearance could be too wide, or the strainer may be stuck in mud, plugging the suction side. Your pump is overheating. Very likely the flow of liquid into or out of the pump is being restricted. Improper impeller clearance could be slowing repriming, or the suction strainer may be clogged. Although this list is not a complete guide to pump inspection and service, it does cover the more common conditions that can impair pump efficiency. Keep in mind that excessive wear could also be the cause of any of the problems in the above paragraphs. Check for air leaks. Using a vacuum gauge, make sure that the suction line, fittings and pipe plugs are airtight. Most Gorman-Rupp pumps have a tapped hole for easy connection of a vacuum gauge. Use pipe dope to seal gauge threads and pipe plugs. Replace leaky seals and badly worn hoses. Check the suction hose lining. The rubber lining in a suction hose can pull away from the fabric, causing partial blockage of the line. If the pump develops a high vacuum but low discharge pressure, the hose lining may be blocking suction flow. Replace the hose. Check the suction strainer. Frequent inspection and cleaning of the suction strainer is particularly important when pumping liquids containing solids. Always use the proper size strainer to prevent the pump from clogging. Check the impeller vanes, wear plate or wear rings. The removable cover plate on many Gorman-Rupp pumps provides quick, easy inspection of the impeller and wear plate. These components should be inspected every six months or sooner, depending on pump application. They are subject to faster wear when pumping abrasive liquids and slurries. Gorman-Rupp wear plates and wear rings can be replaced without replacing expensive castings. Check the impeller clearance. Pumping efficiency will be reduced if the clearance between the impeller and wear plate or wear rings is beyond the recommended limits. If the clearance is less than recommended, components will wear by rubbing, causing excess work for the engine or motor. Check the impeller clearance against the pump manual specifications and adjust it if necessary. Check the seal. Many Gorman-Rupp pumps are equipped with a double seal which is lubricated under pressure by a spring-loaded grease cup, or an oil-lubricated seal for long, trouble-free service. 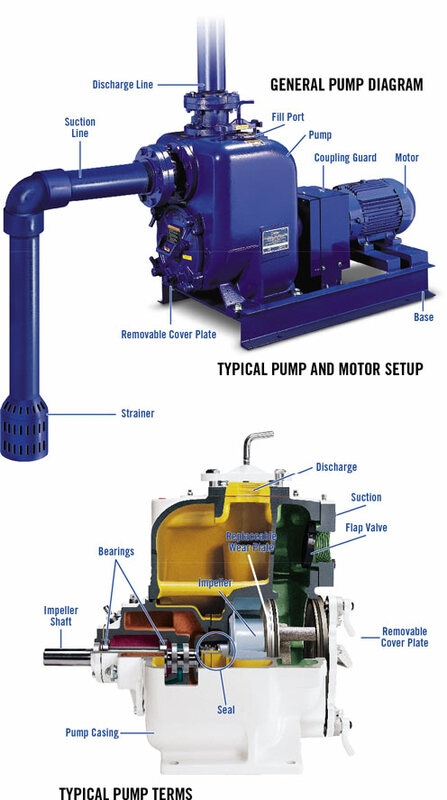 Some pumps are equipped with a single seal that is lubricated by the liquid being pumped. Sand or other solids can cause rapid wear of the seal faces. Check and replace the seal if worn. Replace the seal liner or shaft sleeve if they have scratches. Check the bearings. Worn bearings can cause the shaft to wobble. Eventually, the pump will overheat, and sooner or later it will freeze up and stop. Replace bearings at the first sign of wear. Check the engine or motor. The pump may not be getting the power it needs to operate efficiently. The engine may need a tune-up, or the motor may need service. Check the operating condition. Check air release devices, valves, check valves and shock control devices for proper operation. Old discharge lines are subject to internal rusting and pitting, which cause friction loss and reduce flow by as much as 15%. Replace badly deteriorated lines. If your submersible pump is operating at a reduced capacity, it could be caused by a worn impeller, excessive impeller clearance, low or incorrect voltage, or it could be running backward. A discharge head that’s too high, a clogged or kinked hose, or a clogged strainer could also be responsible for reduced flow. Use an amp meter and volt meter to determine if the pump is getting the proper power it needs to operate efficiently. Normal amp readings are provided in the manual accompanying your pump. If your diaphragm pump isn’t pumping as it should, check the diaphragm, suction and discharge check valve flappers and seats, and replace any worn parts. Check suction hose fittings for leaks, and check the plunger rod for proper adjustment.